A barely visible fog hangs in the air in a California laboratory, illuminated by a laser. 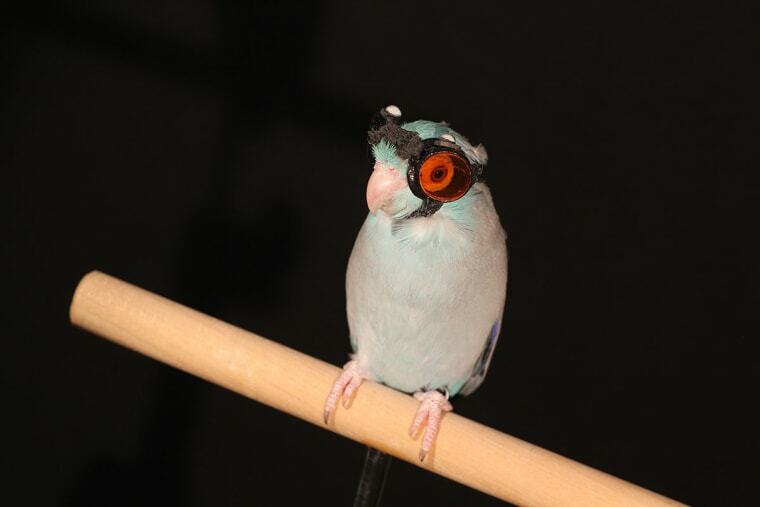 And through it flies a parrot, outfitted with a pair of tiny, red-tinted goggles to protect its eyes. As the bird flaps its way through the water particles, its wings generate disruptive waves, tracing patterns that help scientists understand how animals fly. In a new study, a team of scientists measured and analyzed the particle trails that were produced by the goggle-wearing parrot's test flights, and showed that previous computer models of wing movement aren't as accurate as they once thought. This new perspective on flight dynamics could inform future wing designs in autonomous flying robots, according to the study authors. When animals fly, they create an invisible "footprint" in the air, similar to the wake that a swimmer leaves behind in water. Computer models can interpret these air disturbances to calculate the forces that are required to keep a flyer aloft and propel it forward. A team of scientists had recently developed a new system that tracked the airflow generated by flight at an unprecedented level of detail. They wanted to compare their improved observations to several commonly used computer models that use wake measurements to estimate flying animals' lift, to see if their predictions would be on track. Obi's eyes were protected from the laser's light with custom goggles: a 3D-printed frame that is fitted with lenses cut from human safety glasses — the same type of glasses worn by Lentink and his team. When the laser flashed on and off — at a rate of 1,000 times per second — the water droplets scattered the laser's light, and high-speed cameras shooting 1,000 frames per second captured the trails of disturbed particles as Obi fluttered from perch to perch. Patterns traced in airborne particles allow scientists to track the wing's precise movements during flight.Patterns traced in airborne particles allow scientists to track the wing's precise movements during flight. The tests showed something unexpected. Computer models predicted that once the whirling air patterns — also known as vortices — were created by a bird's wings, they would remain relatively stable in the air. But the patterns Obi traced began to disintegrate after the bird flapped its wings just a few times. "We were surprised to find the vortices that are usually drawn in papers and text books as beautiful donut rings turned out to break up dramatically after two to three wing beats," Lentink told Live Science in an email. He explained that this meant the models, which are widely used in animal flight studies to calculate an animal's lift based on the wake it produced, were likely inaccurate. "Thanks to the high-speed recording, we were able to capture this and play it back in slow motion, so we could see with our eyes how the vortices break up and make it hard for the models to predict lift well," Lentink said. The researchers performed their own calculations about how much lift Obi generated from his wing beats by using a device that Lentink's team developed in 2015 — an enclosed box that's equipped with force sensors so sensitive that they were able to detect vibrations produced by the lab's ventilation system, Lentink said in a statement. They then tested three different models, plugging in the measurements of the air patterns from Obi's flights, and comparing the models' lift estimates to their own. The models produced a range of results — none of which matched the scientists' calculations. Understanding how birds stay aloft could help engineers improve designs for flying robots.Understanding how birds stay aloft could help engineers improve designs for flying robots. Creating better models will be an important next step for studying animal flight, Lentink told Live Science. Video of a be-goggled Obi showed that even a slow-flying parrotlet's wing movements are more complex than scientists had anticipated. Even more variations are likely to exist across species and in animals using different flying techniques, which suggests that the current models are greatly oversimplified, the study authors wrote. Updating them will enable researchers to better understand how animals fly, and could help engineers improve flying robots — many of which mimic animals' powered flight. "Many people look at the results in the animal flight literature for understanding how robotic wings could be designed better," Lentink said in a statement. "Now, we've shown that the equations that people have used are not as reliable as the community hoped they were. We need new studies, new methods to really inform this design process much more reliably." The findings were published online Dec. 5 in the journal Bioinspiration and Biomimetics.